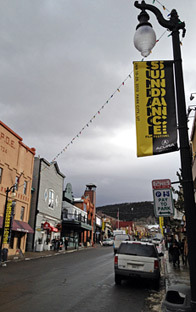 Kicking Off Sundance 2012 - What Films Will We Fall in Love With? We're back in (soon-to-be snowy) Park City, Utah, bundled in layers of clothing, ready to kick off another Sundance Film Festival. This will be my sixth year in a row I've been attending this fest (I started going in 2007) and I'm always incredibly excited to be back. There's something in the air this time, I don't know if it's just me or if it's reading through the film selection on paper or what, but I have a feeling we might fall in love with some wonderful films at Sundance 2012. Or so that is my hope. I always come to every Sundance hoping to fall in love with a few films, to find "the Donnie Darko" or "the 500 Days of Summer" of this year. That's why I pose the question: What will we fall in love with at Sundance 2012? It's impossible to tell. I could scour the guide, find every actor I like and every synopsis that sounds good, but those films could end up being terrible. Then the next day I could see something that I've only heard the title of and be blown away by it. That's one of the many reasons I love Sundance, and film festivals - you never know what you're going to find, and no film is guaranteed to be great (or terrible) until you see it. However, there are a few in particular that I think might be great, and I have my own tastes and favorite-kind-of-films as well. Covering Sundance 2012 for FS.net is: myself, Alex (constant updates @firstshowing), and Ethan (constant updates @ethan_anderton), and we'll be posting reviews, video blogs, maybe a few interviews, and whatever other cool content we can throughout the next 10 days while we're here. Sundance officially kicked off yesterday (January 19th) and runs all the way until January 29th, which is how long we'll both be here, seeing multiple films every day non-stop for almost two weeks. It's always an exhausting, seemingly-never-ending journey to make it all the way to the end, but worth it to get the complete experience. Some of my all-time favorite Sundance films from years past are Drake Doremus' Like Crazy (from last year), Marc Webb's 500 Days of Summer, David Michôd's Animal Kingdom, Derek Cianfrance's Blue Valentine, Adam Elliot's Mary & Max, Max Mayer's Adam, Duncan Jones' Moon, Henry Joost and Ariel Schulman's Catfish, Rodrigo Cortés' Buried, and many others. I always want to find films like these that amaze me and entertain me, and if possible, move me as well. I love stumbling across great docs I've heard good buzz about, I love being surprised by something I didn't expect, I love the experience when the entire audience goes wild for a film at its world premiere. These are the reasons why I always love returning to Sundance, in hopes of similar and, of course, unique experiences that I won't forget. We've listed our Top 10 Sundance 2012 movies we're keeping an eye on, but there's many more yet to be discovered, yet to be seen, and I can't wait to start. So with that said, let's hope it truly is a memorable year, but now it's time to put on extra layers and head out into the snow for my first of four screenings today.
'' TIMELESS'' BEST SHORT FILM EVER ! !